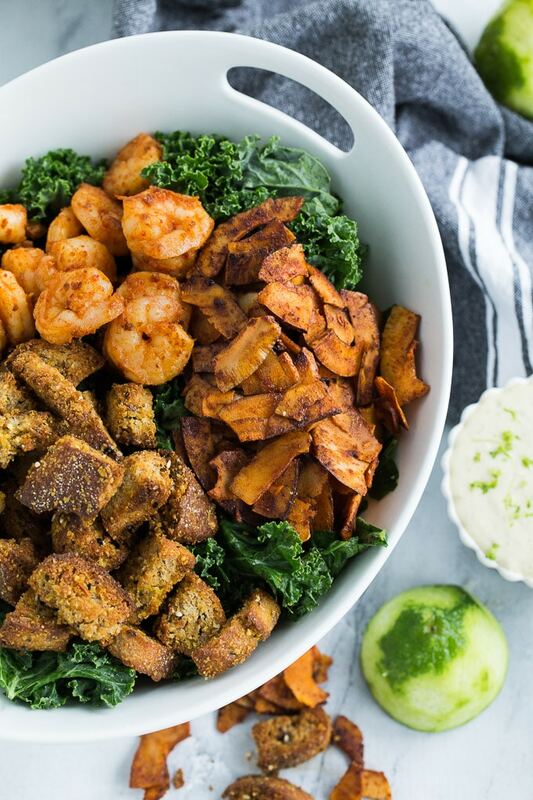 Kale Caesar Salad with Shrimp and Garlic Lime Tahini Dressing! This one is loaded with kale, shrimp, coconut bacon, everything bagel croutons and a homemade garlic lime tahini dressing. It makes a great side salad or meal on its own, and it’s dairy-free with a grain-free option! So various versions of this salad have been on repeat in my house for the past few weeks, and I’m not even a huge fan of caesar salad! It’s always my husband’s go-to salad, but I usually go for a salad that’s full of colourful veggies and topped with a light and fruity vinaigrette. Then, I came across a recipe for coconut bacon in Clean Eating Magazine, and I began thinking of all the ways I could add coconut bacon to my life! My first stop was this Kale Caesar Salad, and I’ve been loving it ever since! But before we get too deep into all the ingredients that go into this salad, we should probably discuss the garlic lime tahini dressing, because let’s face it, the dressing makes the salad. This recipe is actually from my friend Helene, who blogs over at All the Verdure. Helene recently launched an e-book called Good Gut Fuel, and she was kind enough to provide me with a complimentary copy so I could give a few of her recipes a try. Good Gut Fuel is full of tips on good digestion and digestion friendly ingredients, and it includes 10 recipes based on those ingredients. 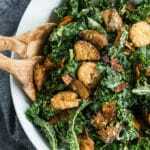 This dressing was the first recipe I tried, and I immediately thought it would go perfectly with this Kale Caesar Salad! 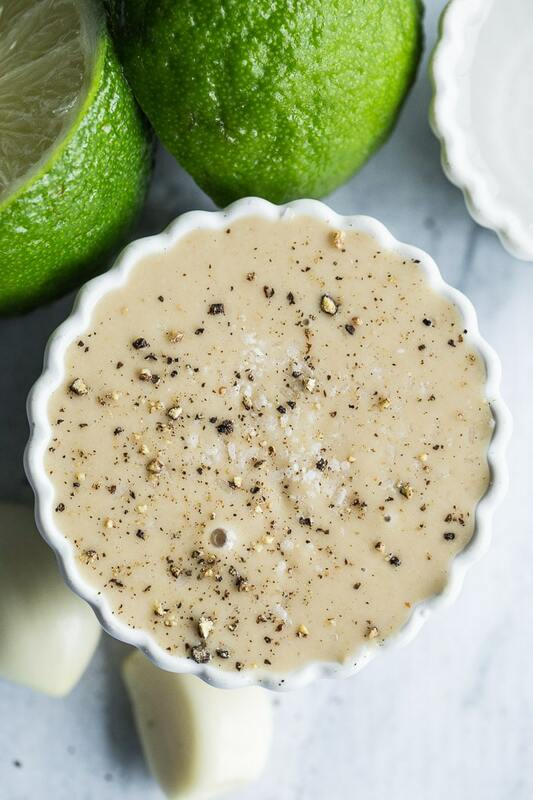 This dressing is thick and creamy, and only requires 6 ingredients – tahini, garlic, lime, salt, pepper and water. The garlic and lime flavours shine through, and balance out the tahini. And you don’t need to break out your blender for this dressing. Just whisk all the ingredients together in a bowl and done! Now that we have the dressing taken care of, let’s tackle the rest of this salad! Sometimes I like to go grain-free, so I’ve also made this salad with roasted chick peas instead of croutons. I use the spicy chick pea recipe from these zoodle bowls. If you’d like to make a vegan version of this salad, just leave out the shrimp and ensure your tamari for the coconut bacon is vegan. If you opt for shrimp in your salad, I like to cook mine with a bit of avocado oil and Trader Joe’s chili lime seasoning. But you can season it anyway you like. Grilled also works well in this recipe. This salad is perfect for meal prepping or making ahead for potlucks. Just prepare and store all of your ingredients separately, and assemble just before you’re ready to eat it. If you assemble it too far in advance, the croutons will get soggy. This recipe might seem a bit involved, but I promise it’s not that difficult to make. If you give it a try, I would love to read about it in the comments below! Or you can always snap a pic and share it on Instagram by tagging @crumbtopbaking. 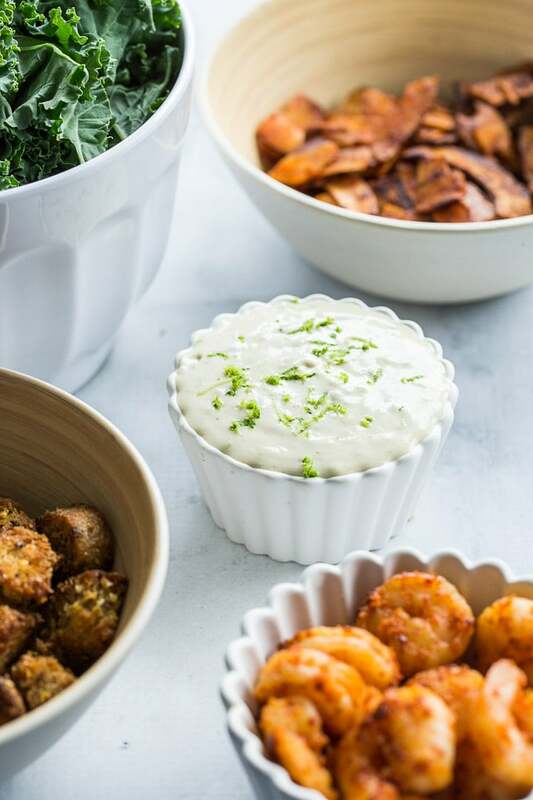 Kale Caesar Salad with Shrimp and Garlic Lime Tahini Dressing is loaded with kale, shrimp, coconut bacon, everything bagel croutons and a homemade garlic lime tahini dressing. It makes a great side salad or meal on its own, and it’s dairy-free with a grain-free option included. To make the croutons: Pre-heat the oven to 350F and line a baking sheet with parchment paper. In a medium-sized bowl, add the cubed bread and drizzle with oil. Sprinkle on the nutritional yeast and everything bagel spice. Mix with your hands until the cubes are well coated. Don’t over-mix as the bread may start to crumble. Spread the croutons out in a single layer on baking sheet and bake for 20 minutes, flipping the croutons after 10 minutes. They should be browned and crispy. Remove from the oven and let cool on baking sheet. You should get about 2 cups of croutons. To make the coconut bacon: Pre-heat oven to 350F and line a baking sheet with parchment paper. In a small bowl, add the coconut, maple syrup, tamari, paprika, oil and pepper. Stir until coconut is well coated. Spread out in a single layer on baking sheet, and bake for 7-10 minutes. Keep an eye on it as it may start to burn quickly. Remove from the oven and let cool completely on baking sheet. It will get crunchy as it cools. To make the dressing: In a small bowl, whisk together the tahini, garlic, lime juice and zest, salt and pepper. Drizzle in the water and whisk until smooth. The recipe makes about 1/2 cup of dressing. To assemble the salad: Add the kale to a large bowl and drizzle on the oil. Massage for a few minutes until the volume of kale starts to reduce in size. Add the croutons, shrimp, coconut bacon and nutritional yeast. Pour on the dressing and toss the ingredients until well coated. Serve immediately. To make this recipe grain-free, substitute roasted chick peas for croutons. To make it vegan, just leave out the shrimp and ensure the tamari you use in the coconut bacon is vegan. If making this salad in advance, prepare and store all of your ingredients separately, and assemble when ready to eat. The recipe for the garlic lime tahini dressing is adapted from All the Verdue. The recipe for the coconut bacon is adapted from Clean Eating Magazine’s recipe for Sweet and Salty Coconut Bacon. This salad looks scrumptious Leanne! Especially that dressing! Heavenly!! Thanks Lisa! 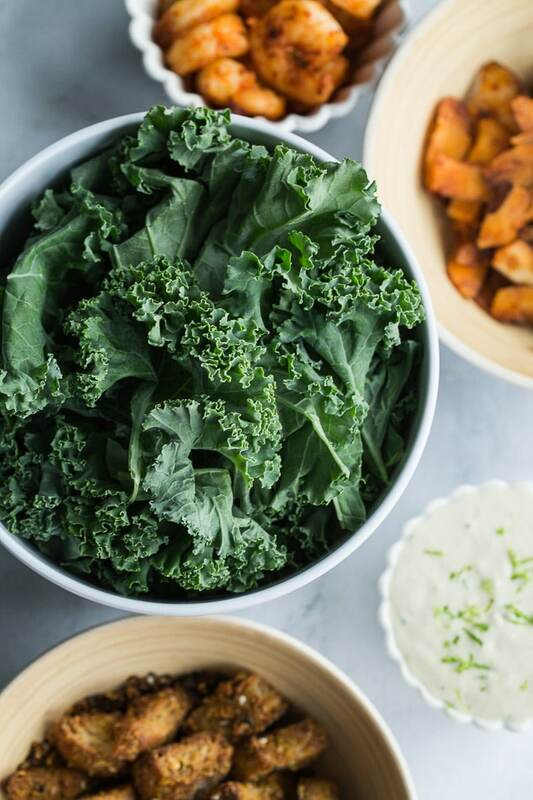 Helene’s dressing recipe pairs nicely with the kale caesar ingredients! Thank you for sharing Helene’s recipe, it looks and sounds so fresh and satisfying! The perfect accompaniment to a sizzling summer day!! I hope you’ve been having an amazing summer, Leanne! Thanks Christina! Helene’s recipe is great! Hope you’re having a great summer too! Such a delicious caesar salad, Leanne! I do love caesar salad, but hardly ever order it out because it’s too basic. But this? Definitely not! 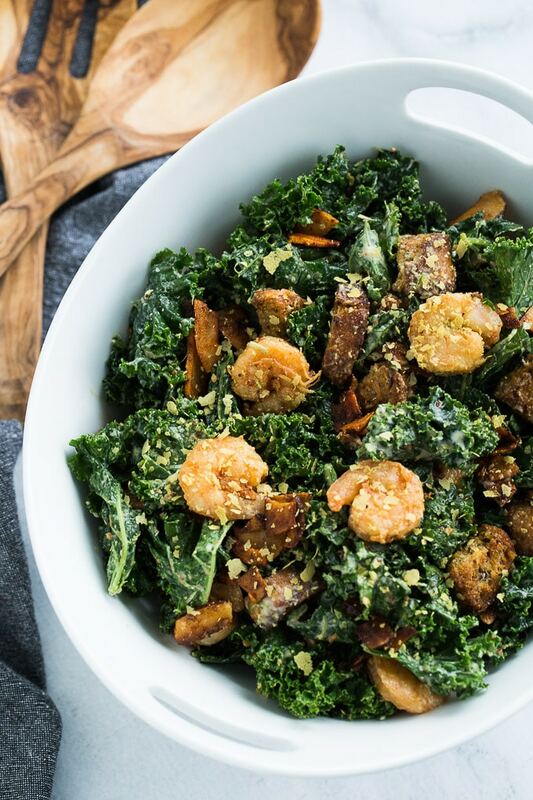 Love the kale and shrimp combo and that dressing sounds deadly! Bet crispy chickpeas would be lovely too. They are a favourite snack around here 🙂 Happy weekend to ya!! Thanks Dawn! I’m on a shrimp kick this summer, so adding them to this salad seemed like a good idea! The crispy chickpeas work well too. Half the time I make this salad, I use crispy chick peas and go completely grain-free. Happy weekend! This is such an awesome salad Leanne! Love the coconut bacon and homemade croutons. The yummy shrimp are always a great addition in my book! Happy Weekend! Thanks Kim! The coconut bacon is a game changer! I want to add it to all my salads! Hope you’re having a great weekend! This looks stunning! I love Tahini dressings, it gives everything such a deep savory taste. Thanks Patrick! I totally agree. Tahini dressings have such a great taste! Wow! I’m loving each and every component to this salad Leanne! 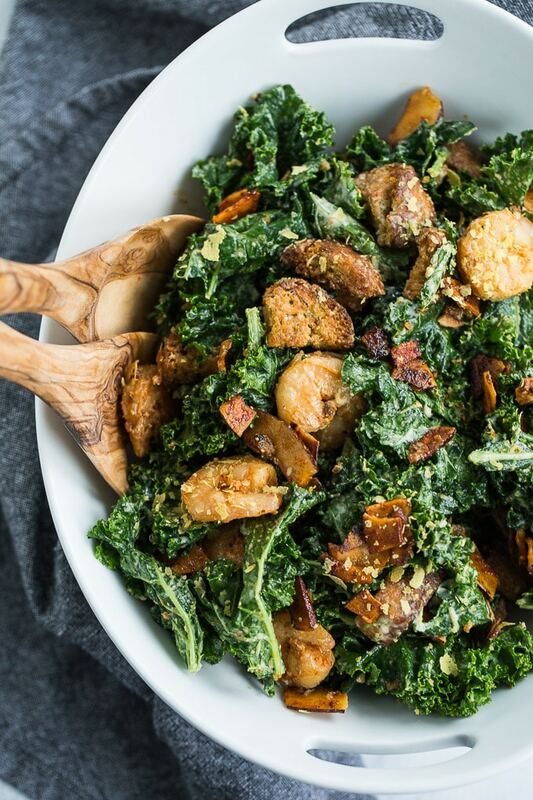 The kale, the dressing, those everything croutons and that coconut bacon. Can’t wait to give this one a try! Thanks so much Mary Ann! There’s a few different components to this salad, but they all work so well together! The coconut bacon might be my favourite! Happy weekend! I normally don’t gravitate toward Caesar salad either as I prefer my salads to be packed with veggies, etc. BUT kale Caesar is a whole different thing. I do order kale Caesars when I see them on a menu, but I’ve never made it at home! That dressing sounds like a great healthier alternative and I can’t wait to try this! Thanks Marcie! Kale definitely takes caesar salad up a notch! 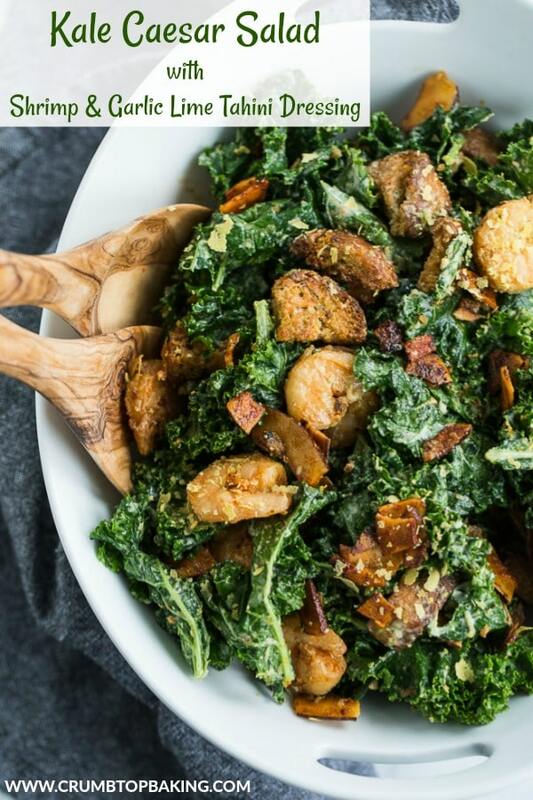 Given all your amazing salad recipes, I’m sure your homemade kale caesar will be delicious! I am sure this kale caesar salad was a big hit in your house. And that dressing is the bomb! I love all the flavors in it, can’t wait to try it out! Thanks Neha! This salad was a big hit with taste testers this summer! And All the Verdure’s salad dressing is the perfect addition! Hope you get the chance to make it! Such fantastic flavours here! This is definitely a great way to jazz up your regular Caesar salad and give it some new life! I could eat this every day. Thanks Tanya! It’s a nice change for sure! And I think while I was recipe testing, I was eating this every day! Thanks so much Terry! That’s so nice of you to say! Thanks Kim! The secret to kale in salads is massaging it and adding lots of flavour. So I find it works in this salad with all the other ingredients. Thanks for pinning, and hope you let me know if you give it a try!